The home care market in Ireland is estimated to be worth just over €700m a year between HSE-funded carers and the private market. As the population ages it is a market that is likely to experience considerable growth in the near future. 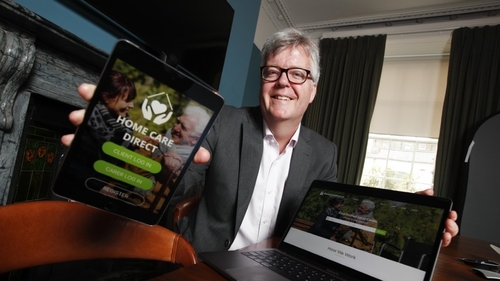 Michael Harty, founder of HomeCare Direct, said his company has launched a new online platform that promises lower costs and better service for those requiring home care. Mr Harty said that the homecare sector is facing a serious of issues and problems, including the shortage of carers due to increased demand as well as the rising costs of homecare for families and the state. There are also worries about the quality of service as carers do not have great employment conditions with some homecare agencies. HomeCare Direct, a website and app, was established to try and address some of those issues. It empowers carers and families to work together and provides them with a suite of tools to do that. It addresses the shortage of carers issue by making homecare more attractive - carers are in control on the app, they can set their own wages and availability which enables them to get the rewards that their difficult and important work deserves. The new app also addresses the rising cost of care for families by removing the agency out of the equation - where appropriate. Mr Harty said that agencies generally charge €25 an hour for a carer, whereas when carers set their own wages they usually charge €18-19 an hour. This represents significant savings for families, he added. But perhaps most importantly, Mr Harty said the new HomeCare Direct platform is a real driver of quality because of the fact that it incentivises carers who are essentially working for themselves. HomeCare Direct takes a commission of 13%, and Mr Harty said that all carers on the site are fully tax compliant. The company handles all the invoicing and administration for them, which is important because there is significant tax relief - up to 40% - available for families. MORNING BRIEFS - Software company Globoforce plans to hire up to 100 new staff over the next three years at its Dublin office. Globoforce's software is used by other companies to help recognise and reward good performance by their staff with the aim of improving corporate culture. Founded in Dublin in 1999 Globoforce now employs 400 people between Ireland and the US. It is opening a new 45,000 sq ft headquarters at Park West in Dublin today. The current expansion will see it recruit new software developers as well as customer service, finance and user experience specialists. *** The world's most valuable stock market listed company, Apple, hit a new record high ahead of quarterly results due to be published tonight, Apple shares closed at $146.58 overnight, up 2% on the day and 25% year-to-date and valuing the company at $769 billion. Apple is expected to report sales of over $53 billion for the first three months of the year a period in which it is estimated to have sold up to 53 million iPhones. This time last year Apple reported its first quarterly decline in revenue for 13 years but has since bounced back. Its shares have gained strongly since the turn of the year in part due to investor optimism that tax proposals announced by the Trump administration will allow it to repatriate money held overseas at a low rate. Apple is sitting on $250 billion in cash. *** Irish manufacturers saw new orders from overseas customers arrive last month at the fastest pace since July 2015. The latest Purchasing Managers Index or PMI from Investec shows activity in the sector was at a three month high in April. Manufacturers hired new workers at the second-fastest pace in seven months according to the employment component of the index. Despite the strong headline figures, however, sentiment weakened and is now at its lowest level since August. Investec's Philip O'Sullivan described this as a "puzzling reading" which conflicts with growth in new orders and the faster pace of hiring during the month. Conor Brophy: What's the real cost of PCP car finance? Five ways to boost your household finances in 2018.